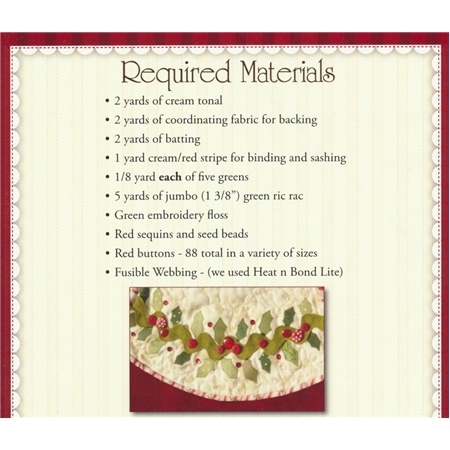 The Holly & Berries Tree Skirt is an original design by Jennifer Bosworth of Shabby Fabrics. The tree skirt features eight scalloped quilted panels of holly, candy cane sashing, jumbo ric rac and plenty of darling buttons and sequins for that wonderful holiday sparkle . The tree skirt is 45" in diameter. A pattern for the coordinating table runner and wall hanging is also available.